Photo: Anderson-Shaffer House ca. 1859, 404 Ross Avenue, Hamilton, OH. Listed on the National Register of Historic Places in 1974. Photographed by User:Greg Hume (own work), 2010, [cc-by-3.0 (creativecommons.org/licenses/by/3.0)], via Wikimedia Commons, accessed April, 2013. The Butler County Courthouse is located at 101 High Street, Hamilton, OH 45011; phone: 513-887-3459. The first court for the county of Butler was held in Hamilton on the second Tuesday in July, 1803, the calendar date being July 12. Subsequently its sittings were held in one of the old buildings of the garrison, which had been erected for a public store house, the Torrence Tavern, corner of Water and Dayton streets. 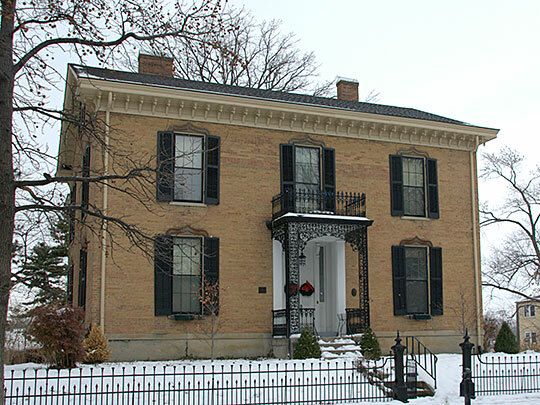 The building remains intact to-day the same as it did in 1803, the property of G. A. Rentschler. The magazine was converted into a jail, and another of the old buildings fitted up for a clerk's office. The house erected for the accommodation of the commandant and officers was occupied as a tavern for the entertainment of the court and bar, and other persons attending. The artificers and barracks were used for stables, etc. The first presiding Judge was Francis Dunlavey, with James Dunn, John Greer, and John Kitchel as associate Judges. Daniel Symmes was prosecuting attorney, James Blackburn, sheriff and John Reily, clerk. In a few years a stone building was erected on the ground set apart for a public square, designed for a jail and jailers house. The upper part of this building was finished for a court-room and the sittings of the court were transferred from the barracks to this building. On October 11, 1809, the first supreme court held in Butler county, convened at Hamilton. Samuel Huntington and William Sprigg were the judges of the court, Arthur St. Clair; prosecuting attorney, John Reily, clerk and William McClellan sheriff. Stephen D. Cone, Biographical and Historical Sketches: A Narrative of Hamilton and Its Residents from 1792 to 1896, Republican Publishing Company, Hamilton Ohio, 1896.